Will Lord with son Jack: "It's ridiculous to close the pool"
Children's laughter and shrieking echo off the walls as Seaton Swimming Pool's fun session gets into swing. Later children appear in the foyer of the Plymouth pool, damp-haired, bedraggled, wrestling to be first to the vending machines. Back in the pool, women of a certain age gossip as they cruise imperiously up and down, three or four abreast. This was the scene last weekend at Seaton which will close on Sunday despite bitter opposition. Seaton Swimming Pool stands out among the shiny new buildings sprouting up around it on the Derriford International Business Park. The pool's paint is peeling, its walls are cracking and its doors long since ceased to swing. Compared with its new neighbours on the medical and technology park, it looks a sorry sight. 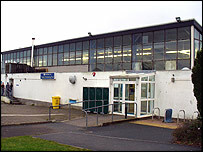 Seaton's six-lane 33m pool has been serving the swimmers of north Plymouth since 1988 when it was leased to the city council by the Ministry of Defence. But now the current owner of the site, the South West Regional Development Agency (RDA), is taking it back. 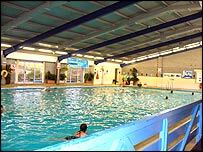 Seaton, the second Plymouth pool to close in the last three years, along with the Ballard Centre in 2003, sells more than 100,000 tickets a year, according to the council. But the council says it cannot afford to keep spending £160,000 a year subsidising the pool or fund another pool in the area and is directing swimmers to Central Park pool near the city centre and to Plympton pool about five miles away. Campaigners Save Seaton Pool have fought a high-profile campaign since the closure was announced last year. A local MP raised the issue in the House of Commons, Baroness Janet Fookes joined the campaign, 150 doctors at Derriford Hospital signed a petition and former Olympic champion Duncan Goodhew voiced his concern. The city council has maintained throughout that it cannot afford the running costs and the £1m repairs it estimates the pool needs. But it is clear from the swimmers enjoying the Saturday afternoon session how much Seaton is valued by local people, not for what it looks like, but for what it offers. "McDonald's is the only other place to go round here," says Emma Duxbury, who has been swimming at Seaton since she was a toddler. She has just been celebrating her 13th birthday at the pool with her friends Kirsty Nicholls, 13, and Amy Paul, 12. Emma said: "It takes too long to get to Central Park. It's always busy and it's going to be even busier with all the people from here." Ashley Green, 11, who was swimming with four friends, said: "We come every weekend, it's my only exercise. Central Park costs too much and it is too far away." Local office worker Lynn Jones said: "The government is saying we should keep fit, but the council is taking the opportunity away. "There's nowhere else to go round here and Plymouth is already woefully short of pools for swimming training." Her friend Yvonne Stephenson said: "There are so many firms springing up round here the council should be investing in this kind of facility, not closing it." 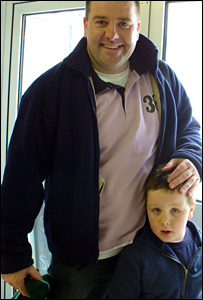 Will Lord, who was with his son John, 5, said: "It's ridiculous to close the pool. On one hand they talk about obesity in children and on the other hand they are closing a facility that promotes healthy kids." Chronic pain consultant Tony Davies, of Derriford Hospital, told a public meeting that closure threatened the fight against childhood obesity. Plymouth Public Health Unit said last month that 6.5% of five and six year olds were actually obese, double the figure 10 years ago. But Mr Davies, said closure of Seaton could see figures rise. He said: "It is clear that the government expects local government to be centre stage in this battle for the nation's health. "Is this really the climate in which we expect one of the few local facilities which help re-dress this problem to be closed without full, informed community consultation?" The RDA said it offered the city council options to keep a swimming pool in the area, including a land swap, but the council decided last year it could not afford it. A council spokesman said: "Investing in the pool would have a serious impact on other priority local services. "The council is fully committed to supporting swimming in Plymouth and is working to secure grants to help build a 50m pool at Central Park alongside other sport and leisure facilities." Eight hundred children from 18 schools use the pool every week, but the council says they will all be found alternative places to swim. The council is offering a free day of swimming at Seaton on Sunday to mark the pool's last day of opening.